Physicians for Social Responsibility, NAACP, SEIU, Union of Concerned Scientists, OCEANA & More Take out Full Page Ads in the New York Times, New York Post, and Oklahoma’s Largest Newspaper. NEW YORK CITY – Forty national civil rights, labor, conservation and environmental organizations representing millions of members and supporters across the United States have taken out a series of full page ads Wednesday calling for the resignation or firing of EPA Administrator Scott Pruitt. On Monday, the Government Accountability Office reported that some of Pruitt’s behavior violates the law. 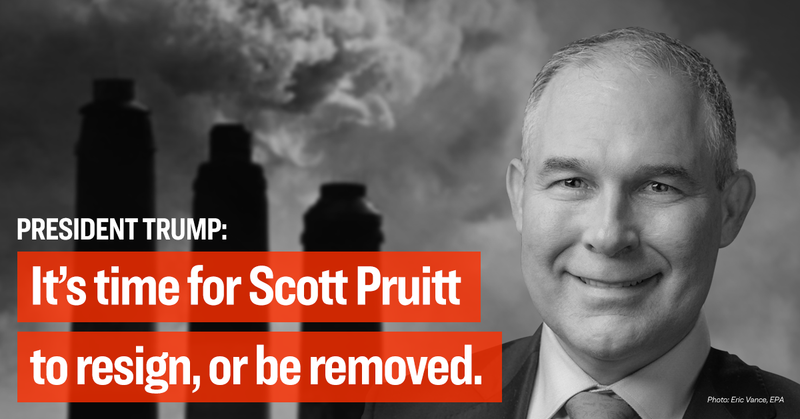 The ads appear in the main news sections of The New York Times, the New York Post (which Donald Trump receives each day), and the largest newspaper in Pruitt’s home state of Oklahoma, The Oklahoman. Increasing public pressure from other Republicans including House Oversight Chairman Trey Gowdy who suggested Pruitt should become ‘a monk’ if he wanted to avoid having his feelings hurt, rather than taking first class flights at taxpayer expense.